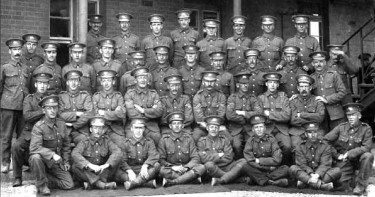 Part of the 7th Bn, Kings Own Royal Lancaster Regiment taken in 1915 just before they went over to war. Letters received this week from local soldiers in France have brought the news that Lance-Corp. P.T. Wilmot (8th Lincolns), of Haxey, died as the result of being struck by shell, and that his remains were buried in the military cemetery behind the fighting lines last Sunday. Although no official confirmation has been received yet, it is feared the news must be accepted as correct. As an athlete Percy Wilmot was well known and popular on the cycle track, in the cricket and football fields, and he made a good soldier. His death is deeply regretted by many friends and much sympathy is felt for his wife and family. United Kingdom Private 21337 King's Own Scottish Borderers 24/10/1916 Age: 20 II. E. 18. United Kingdom Private 1585 Royal Army Medical Corps 23/07/1916 I. C. 56. United Kingdom Corporal 10098 East Lancashire Regiment 17/10/1916 Age: 27 II. E. 3. United Kingdom Private 40995 Manchester Regiment 16/10/1916 II. D. 78. New Zealand Private 24/1884 Otago Regiment N.Z.E.F. 23/09/1916 Age: 21 II. C. 50. Canadian Gunner 85650 Canadian Field Artillery 12/10/1916 Age: 20 II. D. 58. Australian Gunner 9611 Australian Field Artillery 14/11/1916 Age: 22 II. F. 11. United Kingdom Lance Corporal 13181 Yorkshire Regiment 11/07/1916 I. E. 46. United Kingdom Private 11098 Royal Fusiliers 15/09/1916 II. A. 12. New Zealand Second Lieutenant 4/513 New Zealand Engineers 15/09/1916 I. A. 47. Indian Lieutenant Colonel 36th Jacob's Horse 01/07/1916 I. F. 42. United Kingdom Private 9263 The Queen's (Royal West Surrey Regiment) 09/10/1916 II. D. 35. United Kingdom Private 3404 Royal Scots 24/07/1916 Age: 21 I. C. 55. United Kingdom Private 22092 Northumberland Fusiliers 30/04/1916 Age: 17 I. D. 29. United Kingdom Fitter Staff Serjeant L/15502 Royal Field Artillery 30/08/1916 I. C. 77. United Kingdom Private 23813 Royal Dublin Fusiliers 23/10/1916 II. E. 15. United Kingdom Private 33049 Yorkshire Regiment 23/09/1916 Age: 26 II. C. 52. United Kingdom Private 10186 Middlesex Regiment 17/07/1916 Age: 28 I. D. 47. United Kingdom Rifleman 3589 The King's (Liverpool Regiment) 10/09/1916 Age: 21 I. A. 14. United Kingdom Gunner 27091 Royal Field Artillery 01/09/1916 I. B. 67. United Kingdom Private 9015 Northumberland Fusiliers 26/06/1916 Age: 33 I. F. 41. United Kingdom Lance Corporal 9/2915 Durham Light Infantry 16/09/1916 Age: 21 II. A. 5. United Kingdom Lance Corporal 20070 Northumberland Fusiliers 30/04/1916 Age: 33 I. B. 23. United Kingdom Lance Corporal 7232 Royal Fusiliers 18/12/1915 Age: 35 I. C. 4. Australian Corporal 2555 Australian Infantry A.I.F. 11/11/1916 Age: 22 II. E. 57. United Kingdom Private 17292 Northumberland Fusiliers 29/04/1916 Age: 24 I. B. 19. United Kingdom Serjeant 14133 Devonshire Regiment 13/02/1916 Age: 35 I. D. 12. United Kingdom Acting Bombardier 1237 Royal Field Artillery 03/08/1916 Age: 21 I. C. 66. United Kingdom Private 15853 Middlesex Regiment 19/04/1916 I. E. 18. United Kingdom Lance Corporal 13140 Lincolnshire Regiment 21/05/1916 I. D. 32. United Kingdom Gunner L/9025 Royal Field Artillery 17/10/1916 Age: 18 II. D. 75. Australian Private 1888 Australian Infantry A.I.F. 09/01/1917 Age: 28 I. F. 6. United Kingdom Gunner Z/513 Royal Field Artillery 29/08/1916 Age: 22 I. C. 74. New Zealand Private 24/1588 Auckland Regiment N.Z.E.F. 21/09/1916 Age: 23 II. C. 37. Australian Private 15A Australian Army Medical Corps 13/02/1917 Age: 26 I. A. 2. Australian Private 3471 Australian Infantry A.I.F. 15/11/1916 II. F. 7. United Kingdom Private 40106 Cameronians (Scottish Rifles) 15/09/1916 Age: 37 II. A. 19. United Kingdom Private 15313 The Queen's (Royal West Surrey Regiment) 31/08/1916 Age: 21 I. A. 41. United Kingdom Gunner 50617 Royal Field Artillery 17/10/1916 II. E. 1. New Zealand Lieutenant 6/3525 Otago Regiment N.Z.E.F. 15/09/1916 Age: 24 II. A. 42. United Kingdom Second Lieutenant Northumberland Fusiliers 11/07/1916 Age: 25 I. B. 4. United Kingdom Private 6393 The King's (Liverpool Regiment) 26/09/1916 Age: 27 II. C. 68. United Kingdom Private 13130 Leicestershire Regiment 26/09/1916 Age: 21 II. C. 66. New Zealand Private 8/4087 Otago Regiment N.Z.E.F. 15/09/1916 II. A. 1. United Kingdom Private 14782 Dorsetshire Regiment 20/08/1915 Age: 29 I. B. 3. United Kingdom Private 10488 Northumberland Fusiliers 28/06/1916 I. F. 30. United Kingdom Private 20007 Devonshire Regiment 06/09/1916 I. A. 25. Australian Private 2566 Australian Infantry A.I.F. 01/12/1916 Age: 37 II. F. 20. United Kingdom Private 28922 Northumberland Fusiliers 30/09/1916 Age: 25 II. D. 6. United Kingdom Private 17554 Manchester Regiment 25/03/1916 Age: 17 I. E. 8. United Kingdom Second Lieutenant London Regiment (City of London Rifles) 16/09/1916 Age: 23 II. A. 80. United Kingdom Private (Signaller) 18711 Leicestershire Regiment 15/07/1916 Age: 19 I. D. 45. United Kingdom Private 11283 Northumberland Fusiliers 28/04/1916 Age: 35 I. D. 25. United Kingdom Corporal 4041 Yorkshire Regiment 16/09/1916 Age: 23 II. A. 69. United Kingdom Private 3640 Seaforth Highlanders 05/08/1916 Age: 25 I. F. 71. United Kingdom Major Royal Garrison Artillery 15/07/1916 I. B. 41. United Kingdom Corporal 751 Queen's Own (Royal West Kent Regiment) 08/10/1916 Age: 28 II. D. 33. United Kingdom Private 19466 Yorkshire Regiment 28/05/1916 I. B. 28. United Kingdom Private 16740 East Yorkshire Regiment 14/07/1916 I. E. 51. Australian Corporal 1518 Australian Infantry A.I.F. 12/01/1917 Age: 32 I. F. 2. Australian Private 484 Australian Infantry A.I.F. 01/11/1916 Age: 26 II. E. 36. United Kingdom Gunner 20282 Royal Field Artillery 07/08/1916 I. D. 71. Australian Sergeant 4351 Australian Infantry A.I.F. 07/11/1916 Age: 26 II. E. 49. United Kingdom Private 14358 Bedfordshire Regiment 07/09/1915 Age: 23 I. B. 6. United Kingdom Gunner 110126 Royal Field Artillery 26/07/1916 I. E. 57. Australian Sapper 7345 Australian Engineers 14/11/1916 II. F. 9. United Kingdom Rifleman B/50 Rifle Brigade 15/09/1916 II. A. 58. United Kingdom Lieutenant Royal Horse Artillery 23/07/1916 Age: 23 I. F. 57. Australian Sergeant 1862 Australian Machine Gun Corps 18/01/1917 Age: 21 I. A. 8. Australian Private 4658 Australian Infantry A.I.F. 14/11/1916 Age: 24 II. F. 12. United Kingdom Private 18994 King's Own Yorkshire Light Infantry 03/06/1916 I. B. 30. United Kingdom Private 2572 The King's (Liverpool Regiment) 26/09/1916 II. C. 24. United Kingdom Private 7019 The King's (Liverpool Regiment) 25/09/1916 II. C. 62. United Kingdom Second Lieutenant Royal Field Artillery 22/07/1916 Age: 22 I. F. 56. United Kingdom Private 32928 Manchester Regiment 06/09/1916 Age: 22 I. A. 26. United Kingdom Serjeant 7113 Lincolnshire Regiment 04/06/1916 I. C. 37. United Kingdom Lance Corporal 201954 Durham Light Infantry 01/10/1916 Age: 24 II. D. 15. United Kingdom Second Lieutenant Royal Field Artillery 26/07/1916 I. E. 59. United Kingdom Second Lieutenant Royal Field Artillery 15/10/1916 Age: 36 II. D. 68. United Kingdom Private 6120 Northumberland Fusiliers 26/06/1916 Age: 20 I. F. 32. United Kingdom Gunner L/46273 Royal Field Artillery 25/09/1916 Age: 17 II. C. 60. United Kingdom Lance Corporal 3/10289 Durham Light Infantry 16/09/1916 II. C. 21. United Kingdom Lance Corporal 12182 East Surrey Regiment 16/09/1916 Age: 17 II. A. 64. United Kingdom Rifleman R/14563 King's Royal Rifle Corps 05/10/1916 II. D. 24. Australian Private 4073 Australian Infantry A.I.F. 15/11/1916 I. F. 14. United Kingdom Private 2250 Northumberland Fusiliers 17/09/1916 Age: 21 II. A. 60. United Kingdom Private M2/187784 Army Service Corps 20/09/1916 Age: 21 II. A. 94. United Kingdom Private 9895 Worcestershire Regiment 20/07/1916 Age: 31 I. F. 55. United Kingdom Private 6337 King's Shropshire Light Infantry 15/09/1916 II. A. 33. United Kingdom Private 14094 Bedfordshire Regiment 17/09/1915 I. B. 12. United Kingdom Second Lieutenant Machine Gun Corps (Motors) 20/10/1916 Age: 29 II. E. 10. Australian Private 1837 Australian Pioneers 16/11/1916 Age: 22 II. F. 17. United Kingdom Private 10865 Devonshire Regiment 10/02/1916 Age: 27 I. D. 7. United Kingdom Private 13336 Oxford and Bucks Light Infantry 06/10/1915 Age: 21 I. C. 20. United Kingdom Private 20247 Yorkshire Regiment 28/05/1916 I. B. 26. United Kingdom Driver 62698 Royal Field Artillery 11/07/1916 Age: 26 I. B. 37. United Kingdom Second Lieutenant South Lancashire Regiment 08/09/1916 Age: 22 I. A. 19. United Kingdom Driver 23157 Royal Horse Artillery 21/09/1916 Age: 33 II. C. 43. United Kingdom Acting Bombardier 52061 Royal Garrison Artillery 23/07/1916 Age: 31 I. B. 49. United Kingdom Lance Corporal 14773 Bedfordshire Regiment 20/09/1915 Age: 26 I. B. 13. United Kingdom Serjeant 525 Royal Engineers 22/07/1916 Age: 26 I. E. 55. United Kingdom Captain Royal Army Medical Corps 05/09/1916 Age: 24 I. A. 37. United Kingdom Private 5201 East Surrey Regiment 01/09/1915 I. B. 5. New Zealand Rifleman 23/702 New Zealand Rifle Brigade 15/09/1916 II. A. 14. United Kingdom Gunner 20170 Royal Field Artillery 26/07/1916 Age: 26 I. C. 59. United Kingdom Private 18105 The King's (Liverpool Regiment) 05/09/1916 Age: 19 I. A. 30. United Kingdom Private 14816 Bedfordshire Regiment 17/09/1915 I. B. 11. United Kingdom Private 10819 Middlesex Regiment 17/04/1916 Age: 23 I. C. 25. United Kingdom Private 2268 Queen's Own (Royal West Kent Regiment) 07/10/1915 Age: 23 I. C. 16. United Kingdom Private 10276 Lincolnshire Regiment 16/07/1916 Age: 27 I. B. 45. United Kingdom Serjeant 10439 Devonshire Regiment 22/02/1916 I. D. 13. United Kingdom Private 18972 Sherwood Foresters (Notts and Derby Regiment) 07/07/1916 I. F. 34. Australian Sergeant 1003 Australian Army Medical Corps 06/05/1917 Age: 26 I. A. 1. United Kingdom Gunner 21673 Royal Garrison Artillery 02/10/1916 Age: 29 II. D. 14. United Kingdom Private 17363 Hampshire Regiment 15/09/1916 Age: 37 II. A. 29. United Kingdom Gunner 6119 Royal Field Artillery 30/07/1916 Age: 25 I. F. 66. New Zealand Private 11231 Otago Regiment N.Z.E.F. 02/10/1916 Age: 23 II. D. 16. United Kingdom Private 8036 Northumberland Fusiliers 16/09/1916 Age: 36 II. C. 25. United Kingdom Serjeant 19293 Yorkshire Regiment 28/05/1916 Age: 28 I. C. 32. United Kingdom Private 18524 Devonshire Regiment 09/03/1916 Age: 24 I. D. 17. United Kingdom Private 20/327 Durham Light Infantry 11/10/1916 Age: 19 II. D. 50. United Kingdom Corporal 1357 Royal Scots 03/08/1916 Age: 21 I. F. 69. United Kingdom Lieutenant Machine Gun Corps 17/09/1916 Age: 19 II. C. 17. United Kingdom Private 18350 East Lancashire Regiment 01/10/1916 Age: 44 II. D. 10. Australian Private 2350 Australian Infantry A.I.F. 14/11/1916 II F. 8. United Kingdom Private 21220 King's Own Yorkshire Light Infantry 11/04/1916 I. E. 14. United Kingdom Gunner W/3626 Royal Field Artillery 14/07/1916 I. C. 43. United Kingdom Private 5835 The King's (Liverpool Regiment) 09/09/1916 Age: 26 I. A. 20. United Kingdom Second Lieutenant Royal Field Artillery 01/07/1916 Age: 23 I. F. 44. United Kingdom Rifleman 3681 The King's (Liverpool Regiment) 26/09/1916 II. C. 65. United Kingdom Private 8066 Black Watch (Royal Highlanders) 22/09/1916 Age: 34 II. C. 45. New Zealand Captain 2/835 New Zealand Field Artillery 14/10/1916 Age: 32 II. B. 8. United Kingdom Private 47878 Royal Army Medical Corps 04/10/1916 Age: 18 II. B. 2. United Kingdom Private 14139 Yorkshire Regiment 28/05/1916 Age: 24 I. B. 25. United Kingdom Private Z/646 Royal Fusiliers 16/09/1916 Age: 19 II. C. 3. United Kingdom Private 5281 Lincolnshire Regiment 23/05/1916 I. E. 32. New Zealand Rifleman 26/739 New Zealand Rifle Brigade 17/09/1916 II. A. 54. United Kingdom Corporal 17180 The King's (Liverpool Regiment) 18/10/1916 II. D. 80. United Kingdom Corporal 22226 Royal Fusiliers 16/09/1916 II. A. 91. Australian Private 2131 Australian Infantry A.I.F. 06/11/1916 II. E. 48. New Zealand Private 8/2198 Otago Regiment N.Z.E.F. 18/09/1916 Age: 28 II. C. 23. New Zealand Rifleman 24/387 New Zealand Rifle Brigade 30/09/1916 II. D. 8. New Zealand Private 12355 Wellington Regiment N.Z.E.F. 29/09/1916 Age: 23 II. D. 7. United Kingdom Private 11856 King's Own (Royal Lancaster Regiment) 21/07/1916 Age: 19 I. B. 48. United Kingdom Private 12662 Devonshire Regiment 17/03/1916 Age: 30 I. E. 2. United Kingdom Private 13262 Bedfordshire Regiment 10/10/1915 Age: 17 I. C. 15. United Kingdom Gunner 3083 Royal Field Artillery 16/09/1916 Age: 22 II. C. 26. United Kingdom Corporal 14575 Middlesex Regiment 12/06/1916 I. F. 24. United Kingdom Private 12994 Lincolnshire Regiment 02/07/1916 Age: 28 I. D. 39. United Kingdom Driver 23061 Royal Field Artillery 14/07/1916 I. E. 48. United Kingdom Serjeant 2046 Seaforth Highlanders 03/08/1916 Age: 27 I. D. 67. United Kingdom Second Lieutenant Manchester Regiment 07/10/1916 Age: 33 II. B. 6. United Kingdom Captain London Regiment 15/09/1916 Age: 32 II. A. 31. United Kingdom Private 19724 Sherwood Foresters (Notts and Derby Regiment) 09/07/1916 Age: 22 I. B. 36. Australian Corporal 859 Australian Infantry A.I.F. 10/11/1916 Age: 26 II. E. 56. United Kingdom Private 9410 Royal Army Medical Corps 05/09/1916 Age: 22 I. A. 28. United Kingdom Private 4524 The King's (Liverpool Regiment) 06/09/1916 I. A. 24. United Kingdom Private 27416 The King's (Liverpool Regiment) 20/07/1916 I. D. 55. United Kingdom Pioneer 130063 Royal Engineers 06/11/1916 Age: 28 II. E. 43. United Kingdom Private 1085 London Regiment 16/09/1916 Age: 21 II. A. 3. United Kingdom Private 11347 South Staffordshire Regiment 09/07/1916 I. B 35. United Kingdom Lance Corporal 3/7007 Devonshire Regiment 25/03/1916 Age: 25 I. E. 9. United Kingdom Gunner 22733 Royal Field Artillery 30/07/1916 Age: 21 I. E. 65. United Kingdom Private 7966 Royal Warwickshire Regiment 24/07/1916 I. B. 51. Australian Private 5079 Australian Infantry A.I.F. 08/11/1916 Age: 18 II. E. 50. United Kingdom Private 2066 Royal Army Medical Corps 28/07/1916 Age: 17 I. F. 62. United Kingdom Sapper 113994 Royal Engineers 24/09/1916 II. C. 53. United Kingdom Lance Corporal 4/9600 Durham Light Infantry 04/05/1916 I. E. 19. Australian Gunner 3512 Australian Field Artillery 07/12/1916 I. F. 22. United Kingdom Private 9881 1st (King's) Dragoon Guards 26/09/1916 II. C. 78. United Kingdom Private 18172 Manchester Regiment 25/03/1916 I. E. 11. United Kingdom Trooper 3300 2nd Life Guards 17/09/1916 Age: 23 II. C. 16. United Kingdom Private 19023 Northumberland Fusiliers 22/06/1916 Age: 32 I. F. 27. United Kingdom Lance Corporal 3/3317 Black Watch (Royal Highlanders) 09/09/1916 Age: 33 I. A. 16. United Kingdom 2nd Corporal 61801 Royal Engineers 21/12/1915 Age: 28 I. D. 2. New Zealand Driver 2/1769 New Zealand Field Artillery 10/10/1916 II. D. 47. United Kingdom Private 1477 Royal Army Medical Corps 28/07/1916 Age: 19 I. E. 63. United Kingdom Private 3062 Middlesex Regiment 01/10/1915 I. C. 23. United Kingdom Private 5/3030 Durham Light Infantry 28/01/1917 I. A. 5. United Kingdom Lance Corporal S/17457 Rifle Brigade 17/09/1916 Age: 26 II. C. 24. New Zealand Corporal 24/126 New Zealand Rifle Brigade 16/09/1916 Age: 27 II. A. 71. United Kingdom Private 9983 Dorsetshire Regiment 07/07/1916 Age: 23 I. E. 41. United Kingdom Private 47426 Royal Army Medical Corps 04/10/1916 Age: 23 II. B. 4. United Kingdom Gunner 298 Royal Field Artillery 07/08/1916 Age: 20 I. C. 69. United Kingdom Regimental Serjeant Major 6187 East Lancashire Regiment 07/07/1916 I. C. 40. United Kingdom Captain Royal Garrison Artillery 10/07/1916 Age: 28 I. F. 46. United Kingdom Private 2501 Gordon Highlanders 25/07/1916 I. C. 58. United Kingdom Serjeant 14056 Royal Fusiliers 08/10/1916 II. D. 34. United Kingdom Private 7480 Middlesex Regiment 14/04/1916 Age: 26 I. D. 23. United Kingdom Gunner 73651 Royal Garrison Artillery 30/07/1916 I. F. 65. United Kingdom Captain Lincolnshire Regiment 04/06/1916 Age: 35 I. D. 35. United Kingdom Acting Bombardier 973 Royal Field Artillery 24/09/1916 II. C. 52. United Kingdom Rifleman 4835 London Regiment (London Irish Rifles) 16/09/1916 Age: 33 II. A. 62. Australian Lance Corporal 4182 Australian Pioneers 20/12/1916 Age: 40 I. F. 20. United Kingdom Corporal 11355 Leicestershire Regiment 02/10/1916 Age: 21 II. D. 12. United Kingdom Private 512 Gordon Highlanders 04/08/1916 Age: 23 I. B. 60. United Kingdom Corporal 19429 Hampshire Regiment 06/10/1916 Age: 23 II. D. 23. United Kingdom Gunner 34769 Royal Field Artillery 12/07/1916 Age: 30 I. F. 49. United Kingdom Private 6189 Middlesex Regiment 24/11/1915 Age: 19 I. C. 8. United Kingdom Private 1546 Royal Fusiliers 18/12/1915 Age: 32 I. C. 2. United Kingdom Corporal 3105 Black Watch (Royal Highlanders) 28/07/1916 Age: 41 I. B. 55. Australian Captain Australian Infantry A.I.F. 01/11/1916 Age: 25 II. E. 38. United Kingdom Driver L/9815 Royal Field Artillery 15/10/1916 Age: 33 II. D. 71. United Kingdom Private 44158 Manchester Regiment 13/10/1916 Age: 22 II. D. 62. United Kingdom Rifleman C/12291 King's Royal Rifle Corps 16/09/1916 Age: 33 II. C. 32. United Kingdom Private 16272 King's Own Yorkshire Light Infantry 10/06/1916 I. D. 37. United Kingdom Second Lieutenant Royal Field Artillery 17/07/1916 Age: 20 I. E. 52. New Zealand Rifleman 26/963 New Zealand Rifle Brigade 16/09/1916 II. A. 53. United Kingdom Private 14930 Queen's Own (Royal West Kent Regiment) 05/10/1916 II. D. 25. New Zealand Private 11857 Wellington Regiment N.Z.E.F. 01/10/1916 II. D. 9. United Kingdom Private 32 London Regiment 15/09/1916 Age: 25 II. A. 39. United Kingdom Private 17621 Manchester Regiment 25/03/1916 Age: 27 I. E. 6. United Kingdom Corporal 14885 Bedfordshire Regiment 30/09/1915 Age: 24 I. B. 17. United Kingdom Private 503 Highland Light Infantry 15/09/1916 II. A. 13. United Kingdom Private 17627 Manchester Regiment 25/03/1916 Age: 26 I. E. 10. United Kingdom Private 40019 Royal Welsh Fusiliers 16/07/1916 I. C. 48. United Kingdom Private 26923 Somerset Light Infantry 16/09/1916 II. A. 70. New Zealand Serjeant 7/1318 Otago Regiment N.Z.E.F. 16/09/1916 II. A. 24. United Kingdom Private 409 Cameronians (Scottish Rifles) 20/07/1916 Age: 21 I. D. 57. United Kingdom Private 11089 Queen's Own (Royal West Kent Regiment) 29/09/1916 Age: 20 II. C. 89. United Kingdom Private 6789 Middlesex Regiment 29/09/1915 I. B. 16. 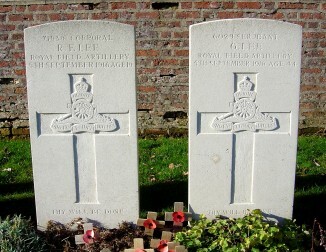 United Kingdom Private 1164 Royal Munster Fusiliers 05/09/1916 Age: 32 I. A. 32. United Kingdom Private 15900 Devonshire Regiment 15/03/1916 Age: 29 I. D. 22. United Kingdom Lieutenant Royal Field Artillery 03/08/1916 Age: 27 I. D. 68. United Kingdom Lance Corporal 11450 Northumberland Fusiliers 29/06/1916 I. B. 34. United Kingdom Second Lieutenant Royal Field Artillery 25/07/1916 I. D. 58. United Kingdom Private 10890 Queen's Own (Royal West Kent Regiment) 07/10/1916 II. D. 32. United Kingdom Rifleman C/12758 King's Royal Rifle Corps 16/09/1916 Age: 21 II. A. 45. United Kingdom Corporal 444 Seaforth Highlanders 30/07/1916 I. B. 58. United Kingdom Private 21989 Durham Light Infantry 09/05/1916 Age: 25 I. E. 23. Canadian Private 417567 Canadian Infantry (Quebec Regiment) 16/09/1916 Age: 31 II. C. 8. United Kingdom Private 40031 King's Own Scottish Borderers 16/09/1916 Age: 19 II. A. 18. Australian Private 2372 Australian Infantry A.I.F. 15/11/1916 Age: 26 I. F. 13. New Zealand Private 11864 Wellington Regiment N.Z.E.F. 17/09/1916 Age: 27 II. C. 18. United Kingdom Private 7651 Lincolnshire Regiment 16/07/1916 Age: 29 I. B. 44. United Kingdom Lance Corporal 18748 Royal Scots 21/08/1916 Age: 21 I. B. 64. United Kingdom Driver L/6299 Royal Field Artillery 09/08/1916 I. E. 71. United Kingdom Captain King's Own Scottish Borderers 16/08/1916 Age: 24 I. D. 75. United Kingdom Captain Northumberland Fusiliers 12/07/1916 Age: 25 I. E. 49. United Kingdom Private 9978 The Queen's (Royal West Surrey Regiment) 16/09/1916 Age: 22 II. A. 76. New Zealand Driver 2/2315 New Zealand Field Artillery 06/10/1916 Age: 28 II. D. 26. United Kingdom Private 17774 Border Regiment 25/10/1916 Age: 21 II. E. 23. Australian Sapper 4259 Australian Engineers 11/01/1917 Age: 19 I. F. 4. United Kingdom Private 16572 Lincolnshire Regiment 11/07/1916 Age: 35 I. E. 45. United Kingdom Private 16101 King's Own Yorkshire Light Infantry 17/09/1916 Age: 23 II. C. 6. United Kingdom Lance Corporal 16/866 Northumberland Fusiliers 29/12/1915 Age: 24 I. D. 5. United Kingdom Private 1816 Cheshire Regiment 12/02/1916 Age: 32 I. D. 11. United Kingdom Private 3211 Seaforth Highlanders 27/07/1916 Age: 34 I. C. 60. United Kingdom Private 45820 Durham Light Infantry 30/09/1916 II. D. 5. United Kingdom Private 21633 South Lancashire Regiment 05/10/1916 Age: 34 II. D. 27. United Kingdom Private 2682 Border Regiment 17/09/1916 Age: 30 II. C. 14. United Kingdom Second Lieutenant South Lancashire Regiment 21/07/1916 I. D. 50. United Kingdom Private 3007 Lancashire Fusiliers 28/09/1916 Age: 26 II. C. 86. United Kingdom Lance Corporal 20068 Devonshire Regiment 15/03/1916 Age: 28 I. D. 21. United Kingdom Second Lieutenant Northumberland Fusiliers 26/06/1916 Age: 22 I. F. 39. United Kingdom Private 18852 Royal Fusiliers 03/10/1916 Age: 21 II. D. 20. United Kingdom Gunner 288 Royal Field Artillery 08/08/1916 Age: 20 I. E. 70. United Kingdom Corporal 16369 Durham Light Infantry 16/09/1916 II. A. 26. Australian Lieutenant Australian Infantry A.I.F. 06/11/1916 Age: 26 II. E. 45. United Kingdom Driver 9075 Royal Field Artillery 27/08/1918 II. E. 62. United Kingdom Gunner 55444 Royal Field Artillery 10/07/1916 Age: 41 I. E. 43. United Kingdom Private 12068 East Yorkshire Regiment 10/07/1916 Age: 24 I. D. 40. United Kingdom Private 19606 Yorkshire Regiment 27/09/1916 Age: 20 II. C. 77. Australian Lieutenant Australian Cyclist Corps 20/12/1916 Age: 24 I. F. 19. United Kingdom Private 27666 Duke of Cornwall's Light Infantry 16/09/1916 II. A. 75. United Kingdom Driver 55673 Royal Field Artillery 11/07/1916 Age: 20 I. B. 38. New Zealand Private 6/2651 Canterbury Regiment N.Z.E.F. 22/09/1916 Age: 30 II. C. 46. United Kingdom Gunner 133591 Royal Field Artillery 07/08/1916 Age: 26 I. C. 70. United Kingdom Private 54368 Durham Light Infantry 16/09/1916 Age: 24 II. C. 5. United Kingdom Private 7334 Royal Fusiliers 18/12/1915 Age: 36 I. C. 3. United Kingdom Private 3794 Gordon Highlanders 26/07/1916 Age: 26 I. E. 58. Australian Private 2415 Australian Infantry A.I.F. 14/11/1916 Age: 26 II. F. 10. United Kingdom Corporal 1944 London Regiment 15/09/1916 Age: 19 II. A. 89. Australian Lance Corporal 2928 Australian Infantry A.I.F. 13/02/1917 Age: 32 I. A. 3. United Kingdom Private 19822 Royal Fusiliers 10/10/1916 Age: 19 II. D. 40. United Kingdom Rifleman R/20444 King's Royal Rifle Corps 15/09/1916 II. C. 15. United Kingdom Sapper 156116 Royal Engineers 01/10/1916 Age: 19 II. D. 11. United Kingdom Gunner 37226 Royal Field Artillery 25/08/1916 Age: 24 I. C. 72. United Kingdom Private 12/2041 York and Lancaster Regiment 20/07/1916 Age: 28 I. C. 52. United Kingdom Captain Highland Light Infantry 15/09/1916 Age: 37 I. A. 9. United Kingdom Lance Corporal 15564 Durham Light Infantry 09/06/1916 Age: 22 I. E. 38. United Kingdom Private 35196 Northumberland Fusiliers 18/09/1916 II. C. 22. United Kingdom Private 3677 Machine Gun Corps (Infantry) 17/10/1916 Age: 21 II. E. 6. United Kingdom Private 7880 Royal Fusiliers 22/12/1915 Age: 23 I. D. 3. United Kingdom Private 9200 Northumberland Fusiliers 28/04/1916 Age: 37 I. D. 24. United Kingdom Driver 3312 Royal Field Artillery 17/10/1916 Age: 19 II. D. 76. United Kingdom Private 20212 King's Shropshire Light Infantry 16/09/1916 II. A. 21. New Zealand Corporal 8/1892 New Zealand Machine Gun Battalion 16/09/1916 Age: 34 II. A. 78. United Kingdom Private 2935 Black Watch (Royal Highlanders) 11/09/1916 Age: 20 I. A 12. United Kingdom Private 3210 Argyll and Sutherland Highlanders 27/07/1916 I. C. 61. United Kingdom Private 5741 Middlesex Regiment 23/11/1915 Age: 20 I. C. 9. United Kingdom Lance Corporal S/7238 Rifle Brigade 16/09/1916 II. A. 49. United Kingdom Private 10272 King's Own Yorkshire Light Infantry 15/09/1916 Age: 25 II. A. 6. United Kingdom Bombardier L/13259 Royal Field Artillery 27/08/1916 Age: 19 I. B. 66. United Kingdom Gunner 63634 Royal Field Artillery 26/12/1916 I. F. 8. United Kingdom Serjeant 1180 Royal Field Artillery 28/09/1916 Age: 22 II. C. 81. United Kingdom Second Lieutenant Manchester Regiment 05/09/1916 Age: 21 I. A. 27. United Kingdom Private 42701 Durham Light Infantry 20/09/1916 Age: 36 II. C. 35. New Zealand Captain 3/1242 New Zealand Medical Corps 21/10/1916 Age: 33 II. B. 12. United Kingdom Battery Serjeant Major 38380 Royal Field Artillery 25/09/1915 Age: 35 I. B. 15. United Kingdom Corporal 13749 Oxford and Bucks Light Infantry 03/10/1915 I. C. 22. United Kingdom Gunner L/11715 Royal Field Artillery 05/09/1916 I. A. 33. United Kingdom Private 17539 Devonshire Regiment 23/03/1916 I. E. 7. United Kingdom Gunner 37170 Royal Field Artillery 19/04/1916 Age: 28 I. C. 26. United Kingdom Lieutenant Royal Field Artillery 09/07/1916 Age: 36 I. F. 45. United Kingdom Saddler 296 Royal Field Artillery 06/08/1916 Age: 23 I. C. 68. United Kingdom Private 17724 Devonshire Regiment 23/03/1916 Age: 23 I. E 5. United Kingdom Serjeant 16144 King's Own Yorkshire Light Infantry 16/09/1916 Age: 21 II. C. 7. United Kingdom Private 5092 Middlesex Regiment 03/10/1915 Age: 17 I. C. 24. United Kingdom Private 1591 Cheshire Regiment 19/02/1916 Age: 19 I. D. 10. United Kingdom Private 40252 Royal Scots Fusiliers 15/10/1916 II. D. 69. United Kingdom Private 6/2784 Durham Light Infantry 16/09/1916 II. A. 55. New Zealand Private 10/2971 Wellington Regiment N.Z.E.F. 17/09/1916 Age: 26 II. A. 59. United Kingdom Rifleman C/1601 King's Royal Rifle Corps 21/07/1916 I. B. 47. United Kingdom Lance Serjeant 3396 The Loyal North Lancashire Regiment 29/09/1916 Age: 23 II. C. 88. United Kingdom Private 7792 Lincolnshire Regiment 25/05/1916 I. E. 33. United Kingdom Private 18619 Manchester Regiment 15/07/1916 I. D. 46. United Kingdom Private 14565 Devonshire Regiment 28/02/1916 Age: 35 I. D. 14. New Zealand Lance Corporal 16/606 New Zealand Maori (Pioneer) Battalion 27/09/1916 II. C. 76. United Kingdom Bombardier 6079 Royal Field Artillery 05/08/1916 Age: 24 I. D. 70. United Kingdom Serjeant 27749 Royal Field Artillery 25/10/1916 Age: 27 II. E. 22. United Kingdom Lance Corporal 4240 The King's (Liverpool Regiment) 28/09/1916 Age: 37 II. C. 87. United Kingdom Bugler 156 Royal Engineers 29/01/1917 Age: 17 I. A. 4. United Kingdom Second Lieutenant Northumberland Fusiliers 26/06/1916 Age: 26 I. F. 38. United Kingdom Private 13799 Oxford and Bucks Light Infantry 06/10/1915 I. C. 21. New Zealand Captain 2/1018 New Zealand Field Artillery 21/10/1916 Age: 29 II. B. 9. United Kingdom Second Lieutenant Worcestershire Regiment 19/10/1916 Age: 20 II. D. 81. United Kingdom Bombardier W/611 Royal Field Artillery 14/07/1916 Age: 22 I. E. 47. New Zealand Corporal 7/2331 Canterbury Regiment N.Z.E.F. 15/09/1916 II. A. 41. United Kingdom Serjeant 20/322 Durham Light Infantry 11/10/1916 II. D. 46. United Kingdom Private 7381 Northumberland Fusiliers 27/04/1916 Age: 21 I. D. 28. United Kingdom Private 9619 Irish Guards 24/09/1916 Age: 24 II. C. 58. United Kingdom Private 6149 Northumberland Fusiliers 27/04/1916 Age: 23 I. C. 28. United Kingdom Private 9199 The Queen's (Royal West Surrey Regiment) 31/08/1916 I. A. 40. United Kingdom Private 40367 Royal Scots Fusiliers 13/10/1916 Age: 32 II. D. 60. United Kingdom Private 3649 Seaforth Highlanders 27/07/1916 Age: 19 I. E. 60. United Kingdom Private R3/16717 Lincolnshire Regiment 13/05/1916 I. E. 28. United Kingdom Private 16721 Oxford and Bucks Light Infantry 07/08/1916 Age: 38 I. D. 63. United Kingdom Private 14679 Bedfordshire Regiment 10/09/1915 Age: 26 I. B. 8. United Kingdom Private 18/1708 Durham Light Infantry 07/06/1916 Age: 26 I. E. 37. United Kingdom Rifleman C/7983 King's Royal Rifle Corps 16/09/1916 Age: 22 II. A. 23. United Kingdom Private 4649 Northumberland Fusiliers 22/06/1916 Age: 21 I. E. 40. United Kingdom Sapper 76329 Royal Engineers 03/11/1916 Age: 21 II. E. 40. Australian Captain Australian Field Artillery 21/12/1916 Age: 21 I. F. 17. United Kingdom Gunner 6221 Royal Garrison Artillery 13/11/1916 Age: 41 II. F. 6. Australian Private 4447 Australian Infantry A.I.F. 01/11/1916 Age: 24 II. E. 34. United Kingdom Private 17391 Manchester Regiment 11/03/1916 Age: 19 I. D. 19. United Kingdom Private 24011 Suffolk Regiment 10/10/1916 Age: 22 II. D. 44. United Kingdom Private 79655 Royal Fusiliers 22/08/1918 II. E. 60. United Kingdom Private 15078 Bedfordshire Regiment 16/08/1915 I. B. 2. United Kingdom Lance Corporal 5/2576 Durham Light Infantry 15/09/1916 Age: 25 II. A. 48. Australian Private 1050A Australian Infantry A.I.F. 24/12/1916 Age: 25 I. F. 15. United Kingdom Private 1252 Seaforth Highlanders 30/07/1916 Age: 21 I. D. 65. United Kingdom Private 3064 Seaforth Highlanders 27/07/1916 I. F. 59. United Kingdom Major Royal Field Artillery 25/08/1916 Age: 34 I. C. 76. United Kingdom Rifleman 1387 The King's (Liverpool Regiment) 07/09/1916 Age: 22 I. A. 21. Australian Gunner 5915 Australian Field Artillery 30/10/1916 Age: 23 II. E. 31. United Kingdom Private 2954 Yorkshire Regiment 16/09/1916 II. A. 28. United Kingdom Private 30822 The King's (Liverpool Regiment) 12/10/1916 II. D. 55. United Kingdom Rifleman 4457 The King's (Liverpool Regiment) 08/09/1916 Age: 20 I. B. 70. United Kingdom Private 6766 Manchester Regiment 15/10/1916 Age: 27 II. D. 72. United Kingdom Gunner 113105 Royal Horse Artillery 22/10/1916 Age: 21 II. E. 14. Australian Private 295B Australian Infantry A.I.F. 24/12/1916 Age: 24 I. F. 9. Australian Corporal 1610 Australian Pioneers 01/12/1916 II. B. 15. United Kingdom Private 18998 King's Own Yorkshire Light Infantry 02/06/1916 Age: 31 I. B. 29. United Kingdom Private 19102 Northumberland Fusiliers 27/04/1916 Age: 35 I. B. 18. New Zealand Private 24/1700 Auckland Regiment N.Z.E.F. 15/09/1916 II. C. 29. United Kingdom Serjeant 2873 The Queen's (Royal West Surrey Regiment) 31/08/1916 I. A. 39. United Kingdom Lance Corporal 13415 East Lancashire Regiment 30/07/1916 Age: 25 I. B. 57. New Zealand Sapper 4/993 New Zealand Engineers 20/09/1916 Age: 25 II. C. 34. United Kingdom Private 9232 Irish Guards 24/09/1916 Age: 33 II. C. 55. United Kingdom Gunner 20672 Royal Field Artillery 21/07/1916 I. D. 52. United Kingdom Lance Corporal 9226 King's Own Yorkshire Light Infantry 11/04/1916 I. E. 15. United Kingdom Private 13115 Northumberland Fusiliers 26/04/1916 I. C. 27. United Kingdom Private 24602 Durham Light Infantry 09/06/1916 Age: 22 I. E. 39. United Kingdom Private R3/17895 Lincolnshire Regiment 16/04/1916 I. D. 20. New Zealand Gunner 2/2176 New Zealand Field Artillery 16/09/1916 Age: 22 II. A. 34. United Kingdom Private 5797 17th Lancers (Duke of Cambridge's Own) 21/12/1916 Age: 20 I. F. 16. United Kingdom Private 6898 Manchester Regiment 15/10/1916 II. D. 73. United Kingdom Private 7419 Royal Fusiliers 17/07/1916 I. E. 50. United Kingdom Gunner 37197 Royal Field Artillery 05/10/1916 II. D. 22. United Kingdom Private 6643 Northumberland Fusiliers 26/06/1916 Age: 35 I. F. 36. United Kingdom Driver 6382 Royal Horse Artillery 01/09/1916 I. B. 71. United Kingdom Private 10369 Northumberland Fusiliers 29/04/1916 I. C. 29. United Kingdom Serjeant 19568 Royal Fusiliers 16/09/1916 Age: 32 II. C. 27. United Kingdom Serjeant 27 Army Veterinary Corps 24/09/1916 Age: 22 II. C. 54. New Zealand Corporal 24/1708 Otago Regiment N.Z.E.F. 22/09/1916 II. C. 47. Canadian Gunner 92921 Canadian Garrison Artillery 12/07/1916 Age: 25 I. F. 47. United Kingdom Private 4/9808 Durham Light Infantry 09/05/1916 Age: 37 I. E. 24. United Kingdom Private 29360 The King's (Liverpool Regiment) 20/07/1916 Age: 19 I. B. 46. United Kingdom Second Lieutenant King's Own Scottish Borderers 09/08/1916 Age: 20 I. D. 74. United Kingdom Private 14114 Manchester Regiment 08/03/1916 Age: 19 I. D. 16. United Kingdom Private 13969 Oxford and Bucks Light Infantry 06/10/1915 I. C. 19. United Kingdom Lance Corporal R/12249 King's Royal Rifle Corps 16/09/1916 II. A. 38. United Kingdom Corporal 40169 Cameronians (Scottish Rifles) 16/09/1916 Age: 19 II. A. 40. United Kingdom Second Lieutenant King's Own Yorkshire Light Infantry 16/09/1916 II. A. 73. United Kingdom Serjeant 6029 Royal Field Artillery 05/09/1916 Age: 44 I. A. 35. United Kingdom Corporal 71939 Royal Field Artillery 05/09/1916 Age: 19 I. A. 36. United Kingdom Private 4637 South Lancashire Regiment 16/09/1916 Age: 32 II. A. 4. United Kingdom Gunner 63915 Royal Garrison Artillery 11/11/1916 Age: 20 II. F. 1. United Kingdom Private 7818 Northumberland Fusiliers 24/10/1916 Age: 28 II. E. 19. United Kingdom Driver 55498 Royal Field Artillery 11/07/1916 Age: 22 I. F. 48. United Kingdom Private 4878 South Lancashire Regiment 26/09/1916 II. C. 70. United Kingdom Private G/18140 Queen's Own (Royal West Kent Regiment) 28/08/1916 Age: 21 II. E. 61. United Kingdom Private 13010 Durham Light Infantry 09/05/1916 I. E. 20. United Kingdom Lieutenant Royal Field Artillery 04/08/1916 Age: 27 I. C. 67. Australian Driver 129 Australian Field Artillery 13/11/1916 II. F. 5. United Kingdom Private 11752 Middlesex Regiment 21/08/1916 I. C. 75. United Kingdom Gunner 55708 Royal Field Artillery 10/05/1916 Age: 22 I. B. 24. United Kingdom Private 23285 Durham Light Infantry 09/05/1916 Age: 27 I. E. 21. United Kingdom Rifleman S/13236 Rifle Brigade 18/08/1916 Age: 19 I. D. 76. United Kingdom Private 9714 Irish Guards 24/09/1916 Age: 28 II. C. 57. Australian Private 1582 Australian Army Service Corps 13/11/1916 Age: 27 II. F. 4. United Kingdom Corporal 12813 King's Own Yorkshire Light Infantry 08/06/1916 Age: 26 I. B. 32. United Kingdom Private 8155 Royal Fusiliers 22/12/1915 Age: 24 I. D. 4. United Kingdom Private 1394 Royal Army Medical Corps 25/07/1916 Age: 20 I. B. 54. United Kingdom Private 21019 Hampshire Regiment 10/10/1916 Age: 26 II. D. 48. New Zealand Private 10/4471 Canterbury Regiment N.Z.E.F. 02/10/1916 II. D. 17. United Kingdom Private 22085 Durham Light Infantry 11/05/1916 Age: 26 I. E. 25. United Kingdom Private 4/9796 Durham Light Infantry 18/09/1916 Age: 35 II. C. 13. United Kingdom Private S/13776 Gordon Highlanders 25/07/1916 I. B. 52. United Kingdom Private 3225 Seaforth Highlanders 27/07/1916 Age: 21 I. D. 61. United Kingdom Private 10539 The Queen's (Royal West Surrey Regiment) 09/10/1916 Age: 27 II. D. 37. United Kingdom Corporal 13985 Welsh Regiment 22/07/1916 Age: 21 I. B. 50. United Kingdom Rifleman 3736 London Regiment (Post Office Rifles) 17/09/1916 Age: 19 II. A. 84. United Kingdom Private 17890 Northumberland Fusiliers 24/06/1916 I. F. 28. Australian Lance Corporal 2817 Australian Engineers 24/10/1916 II. E. 16. United Kingdom Private 19476 Essex Regiment 13/10/1916 II. D. 64. United Kingdom Private 5842 Middlesex Regiment 21/10/1915 I. C. 13. United Kingdom Private 5746 East Surrey Regiment 04/09/1916 I. B. 69. United Kingdom Private 10268 East Yorkshire Regiment 14/07/1916 Age: 18 I. C. 51. United Kingdom Private 3255 Machine Gun Corps (Infantry) 15/09/1916 II. A. 32. United Kingdom Private 1941 Cameronians (Scottish Rifles) 13/08/1916 I. F. 73. United Kingdom Private 3/7940 Bedfordshire Regiment 11/08/1915 Age: 36 I. B. 1. United Kingdom Private 6550 Somerset Light Infantry 12/05/1916 I. E. 27. United Kingdom Private 26103 Duke of Cornwall's Light Infantry 31/10/1916 II. B. 13. United Kingdom Company Serjeant Major 103 Seaforth Highlanders 29/07/1916 Age: 38 I. E. 64. United Kingdom Gunner 70807 Royal Field Artillery 06/08/1916 Age: 21 I. F. 72. New Zealand Private 16/663 New Zealand Maori (Pioneer) Battalion 19/09/1916 Age: 19 II. A. 93. United Kingdom Lieutenant The King's (Liverpool Regiment) 08/09/1916 Age: 19 I. A. 17. United Kingdom Private 3/2253 Black Watch (Royal Highlanders) 15/07/1916 I. B. 39. United Kingdom Private 4350 Argyll and Sutherland Highlanders 25/07/1916 I. B. 53. United Kingdom Gunner 169599 Royal Field Artillery 27/10/1916 Age: 23 II. E. 28. United Kingdom Private 5716 East Yorkshire Regiment 04/05/1916 Age: 26 I. C. 31. United Kingdom Private 2506 Seaforth Highlanders 04/08/1916 Age: 21 I. E. 66. United Kingdom Private 2372 Argyll and Sutherland Highlanders 29/07/1916 Age: 29 I. F. 63. United Kingdom Private 17488 Yorkshire Regiment 28/05/1916 I. C. 33. Australian Private 2645 Australian Infantry A.I.F. 03/11/1916 Age: 32 II. E. 39. United Kingdom Private 7333 Northumberland Fusiliers 29/04/1916 Age: 29 I. B. 20. United Kingdom Lance Corporal 16903 South Lancashire Regiment 21/07/1916 I. D. 53. United Kingdom Private 1990 Royal Army Medical Corps 25/07/1916 Age: 34 I. F. 58. United Kingdom Serjeant 3126 Argyll and Sutherland Highlanders 26/07/1916 I. D. 60. Canadian Battery Sergeant Major 92855 Canadian Garrison Artillery 07/09/1916 I. A. 46. United Kingdom Private 201855 Durham Light Infantry 09/10/1916 II. D. 38. United Kingdom Fitter 88759 Royal Field Artillery 05/09/1916 Age: 23 I. A. 34. United Kingdom Private 11003 King's Own Yorkshire Light Infantry 11/04/1916 I. E. 13. United Kingdom Private 4689 Seaforth Highlanders 27/07/1916 Age: 31 I. E. 61. Australian Private 8788 Australian Army Medical Corps 07/11/1916 Age: 22 II. E. 46. United Kingdom Private 11209 King's Own Yorkshire Light Infantry 21/09/1916 Age: 22 II. C. 42. United Kingdom Gunner 45915 Royal Field Artillery 26/06/1916 Age: 21 I. F. 29. United Kingdom Private 5358 Argyll and Sutherland Highlanders 26/07/1916 Age: 20 I. D. 59. United Kingdom Corporal 5151 Northumberland Fusiliers 22/06/1916 I. B. 33. United Kingdom Lance Corporal S/11806 Black Watch (Royal Highlanders) 11/09/1916 Age: 23 I. A. 11. New Zealand Driver 2/791A New Zealand Field Artillery 21/10/1916 II. B. 11. United Kingdom Private 18964 King's Own Yorkshire Light Infantry 11/04/1916 Age: 29 I. E. 16. United Kingdom Serjeant L/36482 Royal Field Artillery 17/09/1916 Age: 35 II. A. 63. United Kingdom Corporal 7876 Wiltshire Regiment 20/10/1916 II. E. 8. United Kingdom Private 15039 Bedfordshire Regiment 10/09/1915 Age: 21 I. B. 7. United Kingdom Private 16216 Lincolnshire Regiment 12/05/1916 Age: 38 I. E. 26. United Kingdom Serjeant 86629 Royal Field Artillery 25/10/1916 II. E. 21. United Kingdom Private 7823 Northumberland Fusiliers 24/10/1916 II. E. 17. Australian Private 571 Australian Cyclist Corps 04/01/1917 Age: 31 I. F. 11. United Kingdom Second Lieutenant Yorkshire Regiment 14/10/1916 Age: 24 II. D. 67. United Kingdom Private 12639 King's Own (Royal Lancaster Regiment) 30/07/1916 Age: 26 I. C. 64. United Kingdom Acting Bombardier L/9365 Royal Field Artillery 04/10/1916 Age: 20 II. D. 19. United Kingdom Private 11210 Northumberland Fusiliers 30/05/1916 I. E. 34. New Zealand Private 12/2390 Auckland Regiment N.Z.E.F. 16/09/1916 Age: 22 II. A. 47. United Kingdom Private 17/8241 Manchester Regiment 12/10/1916 Age: 25 II. D. 56. New Zealand Gunner 2/313 New Zealand Field Artillery 15/10/1916 Age: 22 II. D. 70. United Kingdom Driver T4/038900 Army Service Corps 12/07/1916 Age: 24 I. E. 44. United Kingdom Corporal 27617 Machine Gun Corps (Infantry) 26/09/1916 II. C. 69. United Kingdom Bombardier 36662 Royal Field Artillery 17/09/1916 II. C. 12. Australian Captain Australian Infantry A.I.F. 06/11/1916 Age: 26 II. E. 41. United Kingdom Bombardier 33095 Royal Field Artillery 27/10/1916 II. E. 25. United Kingdom Private 10682 Manchester Regiment 06/10/1916 Age: 20 II. B. 7. Australian Private 1998 Australian Infantry A.I.F. 25/12/1916 Age: 20 I. F. 14. New Zealand Lieutenant 2/703 New Zealand Field Artillery 21/10/1916 II. B. 10. United Kingdom Private 17990 Manchester Regiment 16/07/1916 Age: 24 I. C. 45. New Zealand Corporal 3/907 New Zealand Medical Corps 16/09/1916 II. A. 17. United Kingdom Private 20683 Machine Gun Corps (Infantry) 13/10/1916 II. D. 65. New Zealand Private 11310 Otago Regiment N.Z.E.F. 25/09/1916 II. C. 59. United Kingdom Private 4921 Highland Light Infantry 16/07/1916 Age: 19 I. C. 46. United Kingdom Private 43171 Manchester Regiment 13/10/1916 II. D. 63. Australian Private 2490 Australian Pioneers 16/11/1916 Age: 26 II. F. 18. United Kingdom Private 27402 Yorkshire Regiment 18/09/1916 Age: 24 II. C. 31. United Kingdom Corporal 2467 South Lancashire Regiment 09/09/1916 Age: 23 I. A. 18. United Kingdom Bombardier 89467 Royal Field Artillery 19/09/1916 Age: 24 II. A. 92. New Zealand Private 8/2091 Auckland Regiment N.Z.E.F. 02/10/1916 Age: 28 II. C. 91. United Kingdom Gunner 47459 Royal Garrison Artillery 26/06/1916 Age: 21 I. F. 26. United Kingdom Serjeant 913 London Regiment 16/09/1916 Age: 26 II. A. 46. United Kingdom Private 8766 Manchester Regiment 12/10/1916 Age: 23 II. D. 53. United Kingdom Private 19862 Wiltshire Regiment 20/10/1916 II. E. 9. United Kingdom Private 4746 London Regiment 15/09/1916 II. A. 7. Australian Gunner 1421 Australian Light Trench Mortar Battery 10/11/1916 Age: 30 II. E. 55. United Kingdom Private 13493 Bedfordshire Regiment 07/10/1915 I. C. 17. Australian Private 5168 Australian Infantry A.I.F. 08/11/1916 Age: 24 II. E. 53. United Kingdom Private 17949 Norfolk Regiment 11/10/1916 II. D. 51. Australian Lance Corporal 1951 Australian Infantry A.I.F. 08/11/1916 II. E. 54. Australian Sergeant 2501 Australian Infantry A.I.F. 22/12/1916 Age: 22 I. F. 18. United Kingdom Second Lieutenant Royal Scots 15/09/1916 Age: 27 II. A. 15. United Kingdom Private 11239 Highland Light Infantry 06/08/1916 I. E. 68. United Kingdom Private 6261 The Loyal North Lancashire Regiment 20/09/1916 II. C. 33. United Kingdom Lance Corporal 2207 The King's (Liverpool Regiment) 26/09/1916 Age: 20 II. C. 61. United Kingdom Private 4275 Seaforth Highlanders 27/07/1916 I. B. 56. Australian Private 1287 Australian Infantry A.I.F. 11/11/1916 Age: 28 II. F. 2. United Kingdom Serjeant 9230 Devonshire Regiment 10/03/1916 Age: 20 I. D. 18. United Kingdom Private 16862 Leicestershire Regiment 16/07/1916 Age: 30 I. B. 43. United Kingdom Lance Corporal 13658 Bedfordshire Regiment 21/11/1915 Age: 25 I. C. 10. Australian Private 2972 Australian Infantry A.I.F. 30/10/1916 II. E. 30. United Kingdom Private 9313 Northumberland Fusiliers 23/09/1916 II. C. 49. New Zealand Gunner 2/777 New Zealand Field Artillery 15/09/1916 II. A. 11. New Zealand Private 11337 Otago Regiment N.Z.E.F. 02/10/1916 Age: 31 II. D. 13. United Kingdom Driver R/845 Royal Field Artillery 05/08/1916 I. D. 69. United Kingdom Private 19760 Cameronians (Scottish Rifles) 15/09/1916 II. A. 5. New Zealand Private 11719 Auckland Regiment N.Z.E.F. 26/09/1916 II. C. 63. United Kingdom Second Lieutenant South Lancashire Regiment 21/10/1916 Age: 24 II. E. 11. Australian Private 3168 Australian Infantry A.I.F. 11/01/1917 Age: 30 I. F. 3. United Kingdom Private 10613 King's Own (Royal Lancaster Regiment) 19/07/1916 Age: 23 I. C. 53. United Kingdom Private 4314 Seaforth Highlanders 27/07/1916 Age: 20 I. C. 62. United Kingdom Serjeant 1670 Middlesex Regiment 06/10/1916 II. D. 31. United Kingdom Private 14160 Lincolnshire Regiment 20/09/1916 Age: 23 II. C. 36. United Kingdom Private 5/4407 Durham Light Infantry 16/09/1916 Age: 34 II. A. 51. United Kingdom Gunner 72068 Royal Horse Artillery 23/08/1916 I. E. 74. United Kingdom Second Lieutenant Royal Field Artillery 14/08/1916 Age: 32 I. F. 74. New Zealand Rifleman 26/368 New Zealand Rifle Brigade 17/09/1916 Age: 28 II. A. 72. United Kingdom Private 18212 Machine Gun Corps (Infantry) 17/03/1916 Age: 25 I. E. 3. New Zealand Rifleman 23/2256 New Zealand Rifle Brigade 29/09/1916 II. D. 2. United Kingdom Private 4897 London Regiment 16/09/1916 Age: 22 II. A. 25. United Kingdom Private 9127 Middlesex Regiment 21/05/1916 I. E. 31. United Kingdom Private 9366 Queen's Own (Royal West Kent Regiment) 16/09/1916 II. A. 10. Australian Private 10453 Australian Army Medical Corps 07/11/1916 Age: 21 II. E. 47. New Zealand Gunner 2/1460 New Zealand Field Artillery 12/10/1916 Age: 29 II. D. 59. Australian Private 5158 Australian Infantry A.I.F. 12/11/1916 II. F. 3. United Kingdom Private 65676 Royal Army Medical Corps 09/08/1916 Age: 21 I. C. 71. Australian Gunner 3414 Australian Field Artillery 25/12/1916 Age: 20 I. F. 10. United Kingdom Gunner 108909 Royal Field Artillery 06/08/1916 Age: 22 I. E. 69. United Kingdom Gunner 17550 Royal Field Artillery 27/10/1916 Age: 21 II. E. 26. New Zealand Private 611692 Canterbury Regiment N.Z.E.F. 22/09/1916 II. C. 48. United Kingdom Private 4321 Seaforth Highlanders 28/07/1916 Age: 22 I. F. 60. Australian Private 537 Australian Infantry A.I.F. 02/11/1916 Age: 24 II. E. 37. United Kingdom Corporal 53509 Royal Horse Artillery 03/09/1916 Age: 26 I. E. 73. United Kingdom Private 22758 The Loyal North Lancashire Regiment 28/09/1916 Age: 24 II. C. 84. United Kingdom Driver T4/240062 Army Service Corps 16/09/1916 Age: 20 II. C. 4. United Kingdom Private 26724 Yorkshire Regiment 22/09/1916 Age: 29 II. C. 44. United Kingdom Serjeant G/541 Royal Sussex Regiment 06/10/1916 Age: 26 II. D. 29. United Kingdom Private 8495 Royal Welsh Fusiliers 20/07/1916 Age: 30 I. D. 51. United Kingdom Private 2857 Middlesex Regiment 21/10/1915 I. C. 12. United Kingdom Rifleman R/21688 King's Royal Rifle Corps 16/09/1916 II. A. 8. United Kingdom Private 23785 Grenadier Guards 10/09/1916 Age: 22 I. A. 13. United Kingdom Private 5265 Northumberland Fusiliers 30/04/1916 Age: 22 I. C. 30. New Zealand Rifleman 23/567 New Zealand Rifle Brigade 17/09/1916 Age: 20 II. A. 79. United Kingdom Acting Bombardier 21066 Royal Field Artillery 01/09/1916 I. B. 68. Australian Private 292 Australian Machine Gun Corps 08/01/1917 Age: 30 I. F. 7. United Kingdom Private 27375 Northumberland Fusiliers 21/09/1916 II. C. 38. 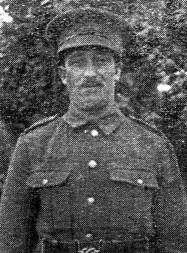 United Kingdom Lance Corporal 12400 Yorkshire Regiment 27/06/1916 Age: 27 I. F. 40. New Zealand Corporal 2/331 New Zealand Field Artillery 20/09/1916 Age: 24 II. D. 1. United Kingdom Private 7673 Royal Fusiliers 15/12/1915 Age: 29 I. C. 5. United Kingdom Private 20887 Essex Regiment 12/10/1916 II. D. 57. United Kingdom Bombardier 103183 Royal Field Artillery 28/06/1916 Age: 29 I. F. 33. United Kingdom Private 201500 Durham Light Infantry 11/09/1916 Age: 17 I. A. 10. United Kingdom Trumpeter 229 Royal Field Artillery 06/08/1916 I. B. 61. United Kingdom Private 40851 Royal Fusiliers 28/07/1916 Age: 37 I. F. 61. United Kingdom Private 14733 South Wales Borderers 25/07/1916 Age: 26 I. E. 56. New Zealand Private 12261 Wellington Regiment N.Z.E.F. 27/09/1916 Age: 33 II. C. 80. United Kingdom Corporal 2268 Northumberland Fusiliers 16/09/1916 Age: 23 II. C. 2. United Kingdom Lance Corporal C/6852 King's Royal Rifle Corps 15/09/1916 Age: 30 I. A. 48. Australian Private 4582 Australian Infantry A.I.F. 30/12/1916 I. F. 12. United Kingdom Private 12630 South Staffordshire Regiment 10/07/1916 Age: 22 I. C. 42. United Kingdom Private 201642 Durham Light Infantry 17/09/1916 Age: 36 II. A. 67. United Kingdom Private 7351 King's Own Yorkshire Light Infantry 10/06/1916 I. D. 38. United Kingdom Private L/10975 Royal Sussex Regiment 06/10/1916 II. D. 28. United Kingdom Private 11912 Gordon Highlanders 03/08/1916 Age: 22 I. F. 68. United Kingdom Fitter Staff Serjeant 518115 Royal Field Artillery 07/09/1916 I. A. 44. United Kingdom Gunner 87325 Royal Field Artillery 26/12/1916 I. F. 13. United Kingdom Gunner 21097 Royal Field Artillery 21/08/1916 Age: 18 I. D. 77. United Kingdom Private 17615 Hampshire Regiment 16/09/1916 Age: 19 II. A. 68. United Kingdom Lance Corporal 9120 Worcestershire Regiment 20/10/1916 II. E. 7. Australian Private 1252 Australian Infantry A.I.F. 06/11/1916 Age: 30 II. E. 42. United Kingdom Captain The King's (Liverpool Regiment) 06/09/1916 Age: 27 I. A. 22. United Kingdom Private 25093 Suffolk Regiment 11/10/1916 Age: 19 II. D. 52. United Kingdom Serjeant 43131 Manchester Regiment 12/10/1916 Age: 32 II. D. 54. United Kingdom Private 4383 South Lancashire Regiment 20/09/1916 Age: 22 II. C. 40. United Kingdom Private 12862 King's Own Yorkshire Light Infantry 10/04/1916 Age: 20 I. E. 12. Australian Private 2863 Australian Pioneers 17/12/1916 I. F. 21. Australian Private 4722 Australian Infantry A.I.F. 21/11/1916 Age: 37 II. F. 19. United Kingdom Private 18905 Somerset Light Infantry 14/04/1916 Age: 27 I. E. 17. United Kingdom Private 17842 Northumberland Fusiliers 20/05/1916 Age: 33 I. D. 34. United Kingdom Private 36277 Yorkshire Regiment 14/10/1916 Age: 22 II. D. 66. United Kingdom Private 22670 Durham Light Infantry 07/06/1916 I. E. 36. United Kingdom Corporal G/12331 Royal Fusiliers 10/10/1916 Age: 25 II. D. 49. United Kingdom Serjeant 6213 Royal Field Artillery 28/07/1916 Age: 23 I. E. 62. United Kingdom Private 16377 Middlesex Regiment 11/06/1916 Age: 20 I. F. 23. United Kingdom Serjeant 997 Middlesex Regiment 09/10/1916 Age: 23 II. D. 39. United Kingdom Major Royal Field Artillery 14/11/1916 Age: 35 II. B. 14. United Kingdom Captain Devonshire Regiment 17/03/1916 Age: 28 I. E. 4. United Kingdom Private 1321 The Loyal North Lancashire Regiment 27/09/1916 Age: 22 II. C. 83. United Kingdom Private 22461 Royal Fusiliers 16/09/1916 Age: 18 II. A. 85. United Kingdom Private 15273 The Queen's (Royal West Surrey Regiment) 31/08/1916 I. A. 42. Australian Private 4863 Australian Infantry A.I.F. 26/10/1916 Age: 47 II. E. 24. United Kingdom Lance Corporal 100872 Royal Engineers 02/08/1916 Age: 36 I. F. 67. United Kingdom Private 45496 Royal Army Medical Corps 04/10/1916 Age: 23 II. B. 3. United Kingdom Private 3425 Cheshire Regiment 12/02/1916 I. D. 8. United Kingdom Private 22468 Northumberland Fusiliers 27/04/1916 I. B. 21. United Kingdom Lance Corporal 7961 King's Royal Rifle Corps 16/09/1916 II. A. 61. United Kingdom Private 14867 King's Own Yorkshire Light Infantry 04/06/1916 Age: 24 I. C. 35. United Kingdom Corporal 7276 Lincolnshire Regiment 04/06/1916 I. B. 31. United Kingdom Sapper 58469 Royal Engineers 14/09/1915 I. B. 9. United Kingdom Private 15561 King's Own Yorkshire Light Infantry 21/09/1916 II. C. 39. New Zealand Gunner 2/1200 New Zealand Field Artillery 21/10/1916 Age: 28 II. E. 12. United Kingdom Private 15434 Lincolnshire Regiment 25/05/1916 Age: 18 I. D. 33. United Kingdom Private 16/48 Northumberland Fusiliers 15/12/1915 Age: 23 I. C. 6. United Kingdom Private 18183 Suffolk Regiment 10/10/1916 Age: 40 II. D. 45. United Kingdom Private 11897 Royal Fusiliers 16/09/1915 I. B. 10. New Zealand Gunner 2/2543 New Zealand Field Artillery 06/10/1916 Age: 23 II. D. 30. United Kingdom Lance Corporal 15994 Middlesex Regiment 17/09/1916 Age: 21 II. A. 88. United Kingdom Private 27935 Northumberland Fusiliers 21/09/1916 Age: 24 II. C. 41. United Kingdom Lance Corporal 7568 King's Royal Rifle Corps 17/09/1916 Age: 39 II A. 52. Australian Private 5187 Australian Infantry A.I.F. 07/11/1916 Age: 29 II. E. 51. United Kingdom Serjeant Major 48909 Royal Field Artillery 14/07/1916 I. F. 5. United Kingdom Private 3716 Seaforth Highlanders 30/07/1916 Age: 22 I. C. 65. United Kingdom Private G/9414 The Buffs (East Kent Regiment) 15/07/1916 Age: 31 I. C. 5. United Kingdom Private 1929 King's Own Yorkshire Light Infantry 04/06/1916 I. C. 36. United Kingdom Private G/8560 The Buffs (East Kent Regiment) 25/07/1916 I. C. 57. United Kingdom Serjeant 5484 Northumberland Fusiliers 23/06/1916 Age: 27 I. F. 25. United Kingdom Private 15525 Leicestershire Regiment 16/07/1916 I. D. 43. United Kingdom Private 17272 King's Shropshire Light Infantry 17/09/1916 Age: 24 II. C. 19. United Kingdom Acting Bombardier 95 Royal Garrison Artillery 17/07/1916 I. F. 53. United Kingdom Private 15197 King's Own Yorkshire Light Infantry 18/09/1916 II. A. 81. United Kingdom Private 6402 Northumberland Fusiliers 26/06/1916 Age: 22 I. F. 35. United Kingdom Private 11639 Gordon Highlanders 02/08/1916 Age: 21 I. B. 59. Australian Private 4770 Australian Infantry A.I.F. 07/11/1916 Age: 36 II. E. 52. United Kingdom Private 16418 Northumberland Fusiliers 28/04/1916 Age: 35 I. D. 26. United Kingdom Second Lieutenant Lincolnshire Regiment 04/06/1916 Age: 29 I. D. 36. New Zealand Private 24/1832 Otago Regiment N.Z.E.F. 16/09/1916 Age: 39 II. A. 74. United Kingdom Private 17980 East Surrey Regiment 31/08/1916 Age: 20 I. A. 43. United Kingdom Sapper 2419 Royal Engineers 16/09/1916 II. A. 66. United Kingdom Private 24469 Wiltshire Regiment 16/10/1916 II. D. 74. United Kingdom Private 15737 Devonshire Regiment 04/09/1916 I. A. 31. United Kingdom Private 18681 Northumberland Fusiliers 30/04/1916 I. D. 30. United Kingdom Private 19791 Bedfordshire Regiment 20/09/1915 Age: 21 I. B. 14. United Kingdom Private 11842 Leicestershire Regiment 28/09/1916 Age: 27 II. C. 82. United Kingdom Private 1389 Gordon Highlanders 30/07/1916 I. F. 64. United Kingdom Quartermaster Serjeant 83630 Royal Field Artillery 26/09/1916 Age: 25 II. C. 67. United Kingdom Private 2144 Middlesex Regiment 15/07/1916 Age: 30 I. C. 47. New Zealand Second Lieutenant 2/1878 New Zealand Field Artillery 09/09/1916 Age: 23 I. A. 15. United Kingdom Private 20950 Hampshire Regiment 09/10/1916 Age: 27 II. D. 41. United Kingdom Private 5221 The King's (Liverpool Regiment) 26/09/1916 II. C. 71. United Kingdom Private 778 Seaforth Highlanders 26/07/1916 Age: 24 I. D. 62. United Kingdom Private 6953 Royal Army Medical Corps 04/10/1916 Age: 31 II. B. 5. United Kingdom Rifleman 5885 London Regiment (First Surrey Rifles) 16/09/1916 II. A. 37. New Zealand Private 8/1384 Otago Regiment N.Z.E.F. 02/10/1916 Age: 37 II. B. 1. United Kingdom Private 5458 Queen's Own (Royal West Kent Regiment) 30/07/1916 Age: 44 I. D. 64. United Kingdom Second Lieutenant Northumberland Fusiliers 28/04/1916 Age: 20 I. D. 27. United Kingdom Private 19092 Hampshire Regiment 09/10/1916 Age: 30 II. D. 43. United Kingdom Gunner 36972 Royal Field Artillery 17/08/1916 I. B. 63. United Kingdom Serjeant 19298 Hampshire Regiment 17/09/1916 Age: 17 II. A. 82. United Kingdom Private G/7824 The Buffs (East Kent Regiment) 09/10/1916 II. D. 36. United Kingdom Private 3004 Seaforth Highlanders 05/08/1916 I. E. 67. United Kingdom Private G/654 Queen's Own (Royal West Kent Regiment) 04/10/1916 Age: 29 II. D. 21. United Kingdom Gunner 22704 Royal Field Artillery 30/07/1916 I. D. 66. United Kingdom Private 34691 King's Own Yorkshire Light Infantry 16/09/1916 Age: 19 II. A. 44. United Kingdom Captain Hampshire Regiment 15/09/1916 Age: 31 II. A. 2. United Kingdom Lance Corporal 19880 Highland Light Infantry 15/09/1916 II. A. 16. United Kingdom Private 18520 Yorkshire Regiment 28/05/1916 Age: 28 I. B. 27. Australian Corporal 2262 Australian Infantry A.I.F. 09/01/1917 Age: 31 I. F. 5. Australian Corporal 4612 Australian Infantry A.I.F. 27/10/1916 II. E. 27. United Kingdom Lance Corporal 513637 Durham Light Infantry 15/09/1916 Age: 26 II. A. 27. United Kingdom Private 18778 Devonshire Regiment 05/09/1916 Age: 18 I. A. 45. United Kingdom Private 10676 Northumberland Fusiliers 27/04/1916 Age: 19 I. B. 22. United Kingdom Private 13911 Northumberland Fusiliers 07/07/1916 I. E. 42. United Kingdom Private 6011 London Regiment 16/09/1916 II. A. 36. United Kingdom Corporal 83024 Royal Field Artillery 25/08/1916 I. C. 73. United Kingdom Lance Corporal 10573 Devonshire Regiment 04/09/1916 I. A. 23. United Kingdom Private 5467 Royal Warwickshire Regiment 31/07/1916 Age: 22 I. C. 63. United Kingdom Second Lieutenant London Regiment (Prince of Wales' Own Civil Service Rifles) 17/09/1916 II. A. 90. New Zealand Rifleman 26/515 New Zealand Rifle Brigade 16/09/1916 Age: 22 II. A. 87. United Kingdom Private 3/8144 Bedfordshire Regiment 04/11/1915 I. C. 11. United Kingdom Gunner 111713 Royal Field Artillery 07/08/1916 Age: 22 I. D. 72. United Kingdom Private 20501 Worcestershire Regiment 20/07/1916 I. C. 54. United Kingdom Serjeant 14905 Somerset Light Infantry 17/09/1916 Age: 22 II. C. 1. United Kingdom Private G/7219 The Buffs (East Kent Regiment) 10/10/1916 Age: 23 II. D. 42. United Kingdom Lance Corporal 10658 King's Own Scottish Borderers 23/10/1916 Age: 25 II. E. 13. Australian Private 8504 Australian Army Medical Corps 06/11/1916 II. E. 44. United Kingdom Gunner L/6124 Royal Field Artillery 05/09/1916 I. A. 29. United Kingdom Second Lieutenant Durham Light Infantry 16/09/1916 Age: 27 II. A. 43. United Kingdom Corporal 1087 Royal Field Artillery 23/09/1916 Age: 19 II. C. 51. United Kingdom Bombardier 58070 Royal Field Artillery 16/10/1916 Age: 24 II. D. 77. United Kingdom Private 40405 Northamptonshire Regiment 31/08/1918 Age: 20 II. E. 59. United Kingdom Gunner 56969 Royal Field Artillery 28/08/1918 Age: 27 II. E. 58. United Kingdom Private 10344 Royal Welsh Fusiliers 20/07/1916 Age: 27 I. D. 56. United Kingdom Rifleman C/703 King's Royal Rifle Corps 22/07/1916 Age: 19 I. D. 54. Australian Private 13857 Australian Army Medical Corps 16/11/1916 Age: 20 II. F. 16. United Kingdom Lieutenant King's Own Yorkshire Light Infantry 15/07/1916 Age: 21 I. F. 51. United Kingdom Private 14275 Middlesex Regiment 15/07/1916 Age: 23 I. D. 44. United Kingdom Rifleman A/1199 King's Royal Rifle Corps 15/09/1916 I. A. 49. United Kingdom Private 7583 Army Cyclist Corps 29/09/1916 II. D. 3. United Kingdom Second Lieutenant Middlesex Regiment 21/10/1915 I. C. 14. United Kingdom Second Lieutenant King's Own Scottish Borderers 08/08/1916 Age: 24 I. D. 73. United Kingdom Private 10081 Irish Guards 24/09/1916 Age: 25 II. C. 56. United Kingdom Lance Corporal 21905 Durham Light Infantry 09/05/1916 Age: 32 I. E. 22. United Kingdom Serjeant 46027 Royal Field Artillery 18/07/1916 I. F. 54. United Kingdom Private 27762 Northumberland Fusiliers 23/06/1916 I. F. 31. United Kingdom Private 15480 Lincolnshire Regiment 04/06/1916 Age: 19 I. C. 38. United Kingdom Lance Corporal 6443 Manchester Regiment 18/10/1916 Age: 21 II. D. 79. United Kingdom Private 3939 Yorkshire Regiment 17/09/1916 Age: 21 II. A. 65. United Kingdom Gunner 68517 Royal Field Artillery 17/09/1916 II. A. 83. United Kingdom Private 26612 Wiltshire Regiment 17/10/1916 Age: 18 II. E. 4. Australian Private 3164 Australian Infantry A.I.F. 01/11/1916 Age: 22 II E. 33. United Kingdom Private 13324 Essex Regiment 30/12/1915 Age: 21 I. D. 6. United Kingdom Lieutenant South Lancashire Regiment 21/07/1916 68 I. E. 54. United Kingdom Sapper 143118 Royal Engineers 13/10/1916 Age: 20 II. D. 61. United Kingdom Gunner 93672 Royal Garrison Artillery 23/01/1917 Age: 34 I. A. 7. United Kingdom Private 16/96 Northumberland Fusiliers 04/12/1915 I. C. 7. United Kingdom Serjeant Major 6751 Queen's Own (Royal West Kent Regiment) 30/09/1916 Age: 45 II. D. 4. United Kingdom Rifleman 3860 The King's (Liverpool Regiment) 27/09/1916 II. C. 79. Australian Private 792 Australian Infantry A.I.F. 01/11/1916 Age: 30 II. E. 35. United Kingdom Private 18698 Lincolnshire Regiment 04/06/1916 Age: 20 I. E. 35. United Kingdom Private 14445 Devonshire Regiment 29/02/1916 Age: 35 I. D. 15. United Kingdom Private 13531 Leicestershire Regiment 15/07/1916 Age: 28 I. C. 49. United Kingdom Private 23675 Worcestershire Regiment 20/07/1916 Age: 19 I. E. 53. United Kingdom Private 39631 Cheshire Regiment 22/08/1916 Age: 38 I. B. 65. United Kingdom Private 31150 East Yorkshire Regiment 17/09/1916 II. C. 9. United Kingdom Private G/4794 East Surrey Regiment 30/08/1915 Age: 19 I. B. 4. Australian Private 2442 Australian Infantry A.I.F. 24/10/1916 Age: 23 II. E. 20. United Kingdom Private 21398 Somerset Light Infantry 16/09/1916 Age: 26 II. A. 9. United Kingdom Private 25286 Leicestershire Regiment 27/09/1916 Age: 24 II. C. 75. United Kingdom Private 20181 King's Own Yorkshire Light Infantry 04/06/1916 I. C. 34. New Zealand Rifleman 25/152 New Zealand Rifle Brigade 16/09/1916 Age: 22 II. A. 35. United Kingdom Lance Corporal 17184 Oxford and Bucks Light Infantry 06/10/1915 I. C. 18. United Kingdom Lance Corporal 14780 Lincolnshire Regiment 16/05/1916 Age: 34 I. E. 29. United Kingdom Private 10/5607 Lancashire Fusiliers 05/07/1916 I. C. 41. United Kingdom Acting Bombardier 689 Royal Field Artillery 06/08/1916 Age: 21 I. B. 62. United Kingdom Gunner 123057 Royal Field Artillery 31/08/1916 I. E. 72. New Zealand Private 6/2962 Canterbury Regiment N.Z.E.F. 28/09/1916 Age: 23 II. C. 85. United Kingdom Private R3/16236 Lincolnshire Regiment 20/05/1916 I. E. 30. United Kingdom Private 5845 Northumberland Fusiliers 17/09/1916 II. C. 20. New Zealand Lance Corporal 6/3932 Canterbury Regiment N.Z.E.F. 17/09/1916 Age: 40 II. A. 86. New Zealand Private 22904 Otago Regiment N.Z.E.F. 16/09/1916 Age: 32 II. A. 30. United Kingdom Corporal L/17306 Royal Field Artillery 17/10/1916 Age: 26 II. E. 2. United Kingdom Serjeant 1118 The Queen's (Royal West Surrey Regiment) 31/08/1916 Age: 29 I. A. 38. United Kingdom Private 3559 Cheshire Regiment 13/02/1916 I. D. 9. United Kingdom Private 1675 Lincolnshire Regiment 16/07/1916 Age: 19 I. D. 49. United Kingdom Gunner 64096 Royal Garrison Artillery 30/10/1916 Age: 26 II. E. 32. United Kingdom Private 4698 Seaforth Highlanders 05/08/1916 Age: 20 I. F. 70. United Kingdom Private 10/5424 Lancashire Fusiliers 07/07/1916 Age: 25 I. F. 43. United Kingdom Private 3880 East Yorkshire Regiment 16/09/1916 II. A. 22. Australian Private 4917 Australian Infantry A.I.F. 23/01/1917 Age: 31 I. A. 6. United Kingdom Private 8312 Machine Gun Corps (Infantry) 17/09/1916 Age: 21 II. A. 77. United Kingdom Lieutenant East Yorkshire Regiment 04/05/1916 I. D 31. United Kingdom Lance Serjeant 13938 Northumberland Fusiliers 22/06/1916 I. C. 39. United Kingdom Private 34709 King's Own Yorkshire Light Infantry 23/09/1916 Age: 19 II. C. 72. United Kingdom Lance Corporal 5384 Machine Gun Corps (Infantry) 16/07/1916 Age: 19 I. D. 48.